Avoid buying into the bulls**t and start buying REAL foods! Most of us are aware that an unpronounceable ingredient that sounds like it belongs in a laboratory, is probably not going to be very good for us. Given what I’ve seen recently, I believe the food manufacturers now may well be cottoning on to this. For example, I was recently making my way into Tesco, about to commence my weekly shop and noticed a poster (hard not to, it was humungous) for Weetabix Protein. My issue is not with companies trying to sell you something (after all, it’s up to us whether we buy it or not) but how they use these buzzwords like ‘protein’ to market their products as healthier, when in point of fact they’re really not. For example, surely Weetabix Protein must be the healthier version. After all, body builders use protein, we all need protein to build muscle and surely more protein is better…right? So how much more protein does Weetabix Protein contain than original Weetabix? A mere 3 grams!! Yet it will cost you quite a bit more to buy, if you were to choose it over the original stuff. As if we're not confused enough about food already, large food companies need to make it even worse! I believe we have a right to know what we’re putting into our bodies, so one thing I always encourage my personal training clients and Boot camp attendees to do is read food labels, looking at their ingredients rather than calorie content. We can help ourselves by becoming more aware of these marketing claims and educating ourselves better about food. 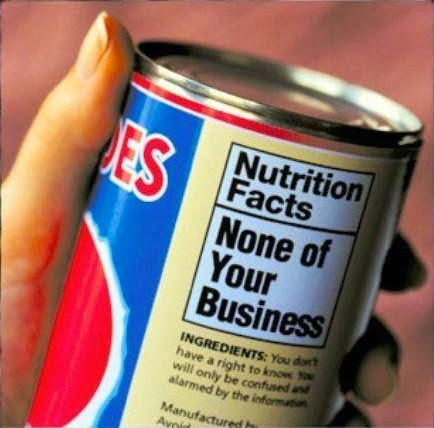 That way, you'll be able to recognise a marketing claim over a TRUE healthy food easily and not buy into the marketing campaigns we are spoon fed (sorry) daily. Click here to see some examples of some awesome people who have already done this!